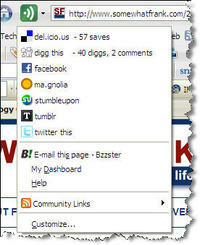 Shareaholic, the popular Firefox extension that aggregates bookmarklets that I previously covered on Somewhat Frank, has released an update which continues to strengthen its value proposition as the web browser extension that offers one stop sharing. Shareaholic has recently added Tumblr, Mixx, Simpy and FriendFeed to its sharing options which already include a number of sites. Shareaholic also offers popularity metrics like how many times the a page you are visiting has been Dugg or saved to del.icio.us. My favorite thing about Shareaholic is that it helps remove some of the clutter that piles up from installing and a number of social bookmarking and sharing bookmarklets. Check out the latest Shareholic release and share to your hearts content.